Keep your wine and bubbly cool in a bespoke Mindy Brownes wine cooler. The rustic design is crafted from metal and given a worn look for authenticity. 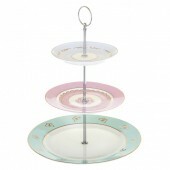 The carry handles make for easy handling and it makes an eye-catching centrepiece at any party. 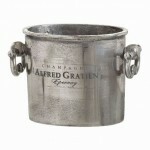 Categories: Gift Ideas, Gifts for Him, Giftware, Home Interiors, Tableware. Tags: lewis, mindy brownes, wine cooler. Brand: Mindy Brownes. 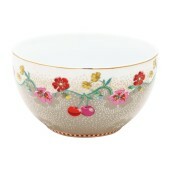 Add pretty design to your kitchen with this Pink Dotted Flower Tea Tip from Pip Studio. 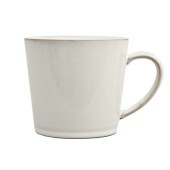 A beautiful and functional large mug from Denby’s new Natural Canvas range. Features the unique ‘chevron’ patterned texture. 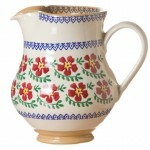 Ideal for tea, coffee or any hot drink. 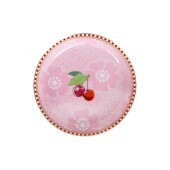 Add vintage style into your dining setting with this Cherry bowl from Pip Studio.